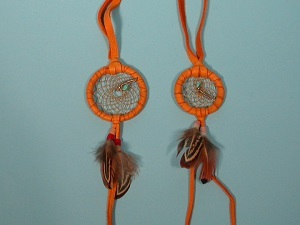 The Navajo Dream Catcher Necklace consists of a turquoise chip inside a deerskin leather-wrapped 1.5" or 2.0" ring. Four glass beads and a feather charm dangle from the leather straps below. Each necklace comes with a card from Mae Stone guaranteeing their authenticity.